“You can play with anywhere from one to 9 players--that’s right, there’s even a solitaire version. The Monopoly Deal Card Game is an amazing family card game that’s highly rated thanks to its fast-paced, addicting gameplay. It’s perfect for a quick game night since it has all the classic pieces of Monopoly without the multi-hour commitment. With Monopoly Deal, you’ll get 110 cards and instructions in the box. The game is designed for two to five people, and it’s best suited for players 8 and up. In the deck, there are cards for all the traditional Monopoly properties, as well as various action cards. During each turn, you’ll pick up cards and play action cards, doing things like charging other players rent, stealing their cards, or demanding money. The goal of this fast-paced game is to collect three full property sets—do that and you win! Each round tends to go quickly, wrapping up in 15 to 20 minutes. Reviewers have great things to say about Monopoly Deal, calling it addicting and lots of fun for the whole family. If the more than 1,000 five-star reviews don’t convince you to try this game, we don’t know what will! Despite its name, this card game is designed for hours of whole-family fun. Not Parent Approved is described as “Cards Against Humanity, but for kids,” so you know it’s going to be a blast to play on the family game night. Not Parent Approved: A Card Game for Kids, Families and Mischief Makers is a fill-in-the-blank word game that can be played with four to 10 players ages 8 and up. In the box, you’ll find 455 durable, premium-printed cards and an instruction pamphlet to get you started. This family-friendly card game is easy to learn and includes a simple gameplay, but it’s sure to deliver big in terms of laughs! To play, one player serves as the “Burp Boss,” putting down a fill-in-the-blank card. Every other player then puts down a funny card from their hand to complete the blank. The Boss then chooses their favorite card—it’s just like Cards Against Humanity, but without the inappropriate content. Reviewers say this is a hilarious family card game and that tween boys find it to be especially fun thanks to their often gross sense of humor. Some parents do note that a few cards may be a little advanced for players younger than 8, so you may want to screen the cards before diving in with your family. Do your kids love playing along with Family Feud on TV? Then you have to invest in the Family Feud Strikeout Card Game. It brings the hilarious fun of this classic game show into your own home! This family card game is best for children ages 10 and up, and it can be played with 3 or more people. Each card in the deck features a classic Family Feud-style question, covering a wide variety of topics. To play, teams try to guess the top answers and avoid strikes, which will volley play to the opposing team. Play goes back and forth until somebody completes the card or strikes out trying. Reviewers say that anyone who loves Family Feud will enjoy this game. Many note that it’s great for parties and traveling, as there’s no gameboard or complicated set-up. You can even play in the car or on a plane, and it’s sure to keep your family entertained for hours. If your family has a competitive side, they’ll love playing Rage, “the card game of revenge.” This game requires a mix of luck and strategy to edge out your opponents, getting rid of as many cards from your hand as you can. It's like a classic trump card game, but with a twist. Rage comes with 110 cards and instructions. You can play the fast-paced game with two to eight players, ages 8 and up. To play, you look at your hand and guess how many “tricks” you can make that turn, bidding that number. The first card played is the trump color, and from there, players try to match it if they can. The highest card in the trump color wins the round. If you don’t have a card in that color, you can put down a Rage Action Card, which allows you to do things like change the trump color, dock points from other players, and more. According to reviewers, there’s a bit of a learning curve with Rage, but once you pick it up, it’s addicting and endlessly entertaining. 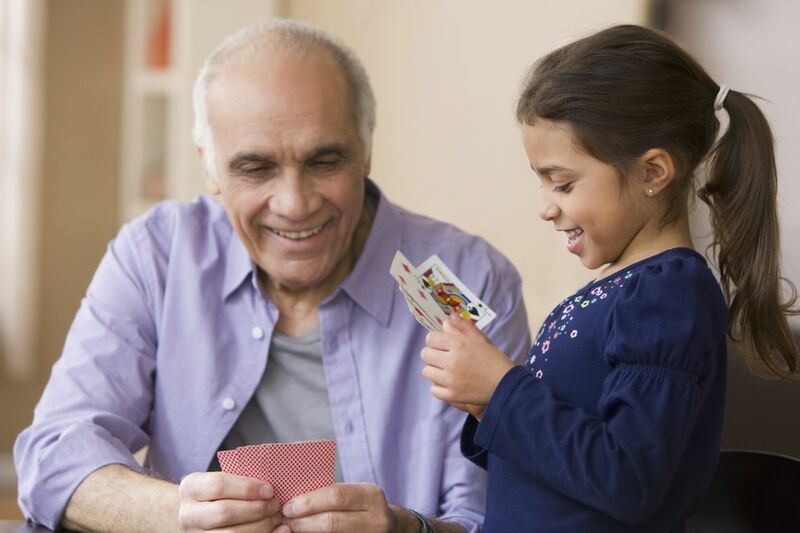 Many say it’s their family’s favorite card game, and each game typically takes less than an hour. What’s a family game night without a little bit of pandemonium? The Face Off card game is a crazy fun free-for-all that will have everyone laughing as you pant like a puppy, make funny faces, and more. Face Off comes with 108 brightly colored cards. There are nine sets of "gem cards” and four sets of "trading signal" cards that force players to make hilarious facial expressions, wild animal sounds, and crazy actions. You can play with three to 9 people, and it’s best for kids ages 8 and up. The goal of the game is to collect 9 matching cards by trading with other players. However, you have to use the set “trading signals” for that round to communicate, making the fast-paced gameplay equally challenging and hilarious. Face Off can get pretty loud and chaotic, according to reviewers. Yet, your whole family is sure to have a blast playing round after round of this unique card game. This card game is a great way to practice spelling skills with your kids! Quiddler is a highly rated word game that’s won more than 20 awards, so you know it’s going to be lots of fun. Quiddler is best for kids ages 8 and up. You can play with anywhere from one to 9 players—that’s right, there’s even a solitaire version. The premise of the game is simple: Form words with the cards in your hand. You can earn extra points by making the most words or the longest word, and each round the number of cards dealt increases for an additional challenge. The player with the most points at the end of eight rounds wins! Reviewers compare Quiddler to Scrabble, saying it’s an addicting and challenging word game that the whole family can play. With over 1,000 5-star reviews, it’s safe to say this card game will become a new household staple. No kittens were hurt in the making of this game! This silly, family-friendly card game is like nothing you’ve ever played before. Exploding Kittens was one of the most-backed projects in Kickstarter history, and it has more than 5,500 5-star reviews from smitten families. You can play Exploding Kittens with two to five players ages 7 and up. The game includes 56 cards, all featuring things like exploding cats, wizard goats, pig-a-corns, and more. During gameplay, players take turn drawing cards. Cross your fingers and hope you don’t pick the exploding kitten card, which means you’re out of the game. However, if you do get a malicious kitty, there are a few ways to defuse or deflect it, depending on what other cards you have in your hand. There’s a lot of luck involved in Exploding Kittens, but you can also get strategic about sabotaging your opponents. Don't worry, you’ll learn helpful strategies the more you play. The whole family will love Exploding Kittens, as it’s unlike any other card game. Reviewers say that while the game may seem complicated, it’s quick and easy to learn. Many even say their children younger than 7 were able to keep up! If you’ve ever played Apples to Apples, you know the popular card game is an absolute riot—but not always appropriate for kids. Luckily, there’s Apples to Apples Junior, which makes the fun and hilarity of the original game accessible to younger crowds. Apples to Apples Junior is best for kids ages 9 and up, and you can play with four to eight people. In the box, you’ll find 576 cards. There are red cards featuring nouns like monkeys, flip-flops, pickles, and everything else you can think of. The green cards have one-word characteristics like crunchy, smelly, and excellent. To play, each person gets a hand full of red cards. One green card is flipped over, and players have to put down the red card they think best fits that characteristic. The dealer for that turn then picks their favorite combination—the results are often hilarious! Reviewers say this card game is fun and easy for kids to learn, and several noted that it’s just as entertaining as the “adult” version. Some users say that you can even play with kids younger than 9—as soon as children learn to read, they can grasp this fun card game.